Jio Institute by Reliance Foundation Wiki and official website: Mukesh Ambani, the Reliance Industries chairman and managing director led the team that made presentation to the Empowered Expert Committee (EEC) and succeeded in convincing the committee to select the proposed Jio Institute by Reliance Foundation among the six institutes to get Institute of Eminence tag. The committee led by former Election Chief Commissioner N Gopalaswami picked three public and three private universities. Earlier in 2016, IoE scheme, then called the World Class Institutes programme was announced by secretary, higher education, at HRD ministry in 2016. However, regulations were declared in September 2017 for institutes to be recognized as Institute of Eminence. February this year, the EEC was set up. The first presentations for IoEs were stared this April. A Jio team made of eight members made the presentation before the committee. Mukesh Ambani was very well-versed with all the aspects related to Jio Institute that he single handed replied to all the questions by the committee members. The presentation focused on the Reliance group’s ‘transformational impact’ on key sectors in India, their spending on research projects in last five years that was worth Rs 6,000 crore and their connection with the top 50 global universities. It also mentioned their establishments in the field of education which include the Dhirubhai Ambani Institute of Information and Communication, the Pandit Deendayal Petroleum university, 13 Reliance Foundation Schools and Dhirubhai Ambani International School. It also cited Mukesh Ambani’s association with IIM Bangluru (He is the ex-chairman). 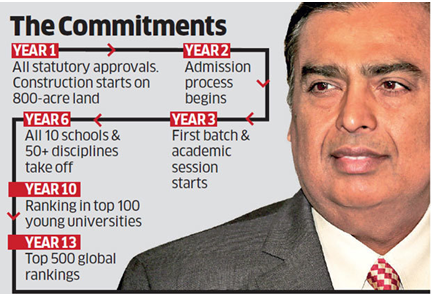 Reliance had applied under the Greenfield category for the Jio Institute and is the only institute that has been selected in that category among the other 11 including Vedant University, KREA University, Indian School of Business, Hyderabad, Airtel for Bharti University and more. As there are no achievements to assess Greenfield institution, the EEC assessed on the ground of information pertaining to promoter group, financial resources, commitment towards the projects along with leadership reputation. The proposed Jio University is a dream project of Ambani. The institute is to be set up in Karjat in Maharashtra. The campus will be set up across 800-acre. It will have 10 schools offering over 50 disciplines which will include engineering, medical sciences, humanities, sciences, urban planning law, sports and performing arts. The foundation is to hire faculty from the top 500 global universities, a residential university city for its teachers and inter-disciplinary research centres to be set up to work towards finding solutions for real-world challenges. They are committed to spend Rs 9,500 crore towards funding for the institute. Among the five others to get the IoE status are three public institutes IIT Bombay, IIT Delhi and IISc Bangluru and two private institutes Bits Pilani and Manipal Academy of Higher Education. There were total 114 applicants. Total 20 institutes were to be selected, but the EEC found only six deserved the status. The public institutes to get the IoEs will be provided funding from MHRD. No funding will be provided to institutes from private sector. The IoEs institutes will get autonomy. They can collaborate with foreign universities without any approval from government. IoEs are targeted to be among 500 top ranking global institutes in the time frame of 10 years and in the top 100 over the time.